Krivo Humbucking Pickup for Resophonic Guitars. Only 6mm thick, the Krivo HumbuckingResophonic pickup is optimized tonally and aesthetically to suit National type resonator guitars (including Squarenecks). Krivo's proprietary ​Optimized Microphonics faithfully capture the sound of your particular instrument. The Resophonic Model has a compact and rectangular housing with an attractive nickel finish to match the classic appearance of metal-bodied resonator instruments. No preamp is necessary, just plug in to any guitar or acoustic amp, or via a direct-box straight into a P.A. system. Mounts easily with included finish-safe putty. The Chrome Nuévo: A Versatile Single Coil Pickup for Jazz Guitars. The most traditional pickup in the Krivo line, the Nuevo single-coil pickup is the Krivo pickup which is closest in sound and appearance to the traditional Stimer™ pickups popularized by Django Reinhardt during his late electric period but without the harshness and poor balance evinced by the vintage Stimers. However, this is not merely a "gypsy-jazz" pickup: the Nuevo excels on archtop jazz guitars and resonator guitars. Furthermore, the Nuevo ​has a much higher output and lower noise than competing single-coil pickups. It has a wide dynamic range and superior headroom as only neodymium powered pickups can obtain. The Krivo petit-bouche Djangobucker is the first humbucking pickup specifically created for oval-hole Gypsy Jazz guitars. 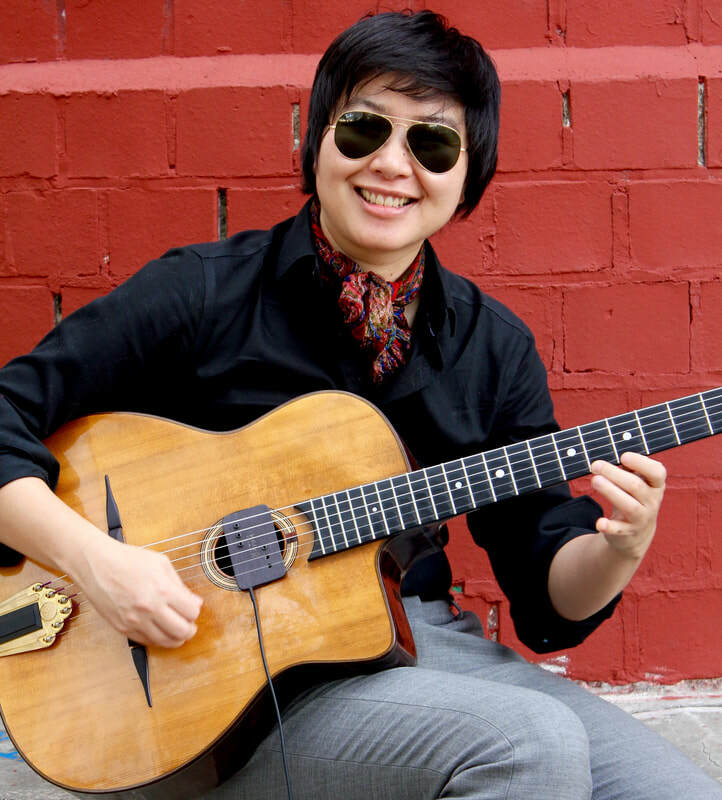 Endorsed by Robin Nolan, Lisa Liu, Paul Mehling, Dani Rabin, Will Dickerson —and many many more professional guitarists. Simply the best magnetic pickup for oval-hole gypsy-jazz guitars or your money back! Designed for a snappy acoustic Gypsy-Jazz tone and is fully adjustable for perfect string-to-string balance. The Djangobucker perfectly recesses into the idiosyncratic fretboard cutaway of petít-bouche guitars for a "seamless" look. At only 6mm thick, the Djangobucker will fit virtually ANY oval-hole guitar. Do you play a D-Hole (Grande Boúche) Gypsy guitar?—then I highly recommend my Micro Manoúche (humbucker), or Nuevo Chrome (single-coil) pickup which are the best Krivo pickups for D-hole or F-hole gypsy guitars. My new mini-humbucker is very clean and flattering pickup with lots of output. This exciting little marvel is based on my critically-acclaimed Nuévo single-coil pickup but with an added noise cancelling "intelligent coil™". This pickup provides a warm sound with a very sweet and clear midrange. Great for archtop jazz guitars, slide guitar—and more: this pickup can also be used on bouzouki, balalaika, 5-string banjo, and tenor guitar. The mini-humbucker is thus the most versatile pickup in the Krivo line. A mere 1/4" thick: the Mini-Humbucker installs and removes in seconds and requires no modification to your guitar. The Krivo Mini-Humbucker is now featured on Emerald X10 guitars and select archtops by Fibonacci Guitars.